Between 12 and 1 o'clock yesterday morning a fire broke out in the Engine room of Messrs. McQuesten & Co's Foundry,1 situated on the corner of James and Merrick Streets, and directly opposite the City Hotel. The firemen were soon on the spot, but all efforts to save the building were unavailing, although they prevented it spreading to the adjacent frame building. The fire, shortly after breaking out, communicated with the warehouse on the corner joining the Engine Room. Great exertions were made to prevent the fire extending to the extensive range of moulding shops in rear, and happily they were successful. The want of water was seriously felt, none being to be had except from the City Hotel. Messrs. McQuesten & Co. estimate their loss at about 3750 [Eng. Lbs. ], which is covered by 1700 [Eng. Lbs] insurance--on the Building 400 [Eng. Lbs]--on machinery and stock 1300 [Eng. Lbs]--in the Gore mutual and two Hartford Companies. They hope to put the Burlington Iron Works into opperation [sic] within two weeks, and by the 1st November to be in a position to meet all demands. It was a miracle that more were not prostrated in the ruins. The young man was extricated as soon as possible, but he was taken out quite dead. The others were immediately removed, one of whom, as we have already stated, survived but a short time, the others are likely to recover. William Henry Woods, First Lieut. 4th Company Fire Brigade, aged 22 years, injured--since dead. William Omand, 3rd Company Fire brigade severely injured. Loftus Major, Second Lieut. 4th Company Fire Brigade, slightly hurt. In addition to the above, a stranger is reported to have been seen in the alleyway, when the wall fell, and was not afterwards seen. He is supposed to be in the ruins. 1 The illustration here may or nay not be the foundry that was burnt. We do have an illustration similar to this one that shows a building similar to this one and it is shown across the road from the Royal Hotel at James & Merrick. McQuesten's first foundry was at James & Merrick which is where the Eaton Centre/ City centre is now. Dr. Calvin McQuesten's partner for the foundry became his cousin John Fisher. 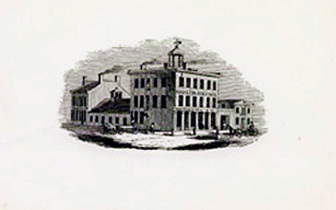 A new and larger foundry was rebuilt at the foot of Wellington Street to facilitate shipping. A description extant may be that of the original foundry that was destroyed by fire, or it may just be a description of an early foundry; it is as follows: "[It was] a building of not less than 18 X 24 feet and was located on the west side of James Street. The source of power for the operation was a horse-power in the basement. It was used to power a bellows that introduced a blast into the cupola. The cupola was fed scrap-iron and pig-iron by the budketful from the top and molten iron was removed at the bottom. The shop was equipped with a lathe, planing machine and crank. The latter machines were for turning out the wooden patterns that made the impressions in sand moulds and for cutting out the various parts of the machines they planned to produce." (Minnes 2) For more on the history of the foundry, see also Fisher W-MCP5-6.240. For more information on McQuesten family members mentioned in these letters, go to the Home Page, click on Family and then on that person's picture. For others do a search on the name to find other information. Dr. Calvin McQuesten likely owned the Royal Hotel in Hamilton, which was across the road from the first foundry at James & Merrick. These and following documents are in the McQuesten files. Or Dr. McQuesten may have held the mortgage, or he may have done the repairs through his foundry. The Royal Hotel was opposite the foundry. There is an drawing/illustration of the two on each side of Merrick at James. It is in the Photos section. See letters about Dr. Calvin McQuesten and Royal Hotel, lease, repairs, mortgage, dividends and Isaac's debts: W0198, 1858; W0310, 1859; W0262, 1859; W0206, 1859, W0308, 1859; W0309, 1859; 0305, 1859; W0306, W0307, W0308, W0262, W-MCP5-6.350; Box 03-226, Box 03-337; W0337. Box 14-111. 2 An article appeared in the Hamilton Spectator on September 13, 2011 in "Flashback, This Day in History, Sept, 13, 1854." "Lawrence Bowers and William Woods became the first Hamilton firefighters to die in the line of duty. The men were killed after a wall at the Fisher and McQuesten foundry at James and Merrick streets collapsed in a major blaze that started in the engine room. A third firefighter was also trapped under the wall but managed to survive. After recovering from his injuries, William Omand went on to become deputy fire chief from 1879 to 1881. A civic holiday was declared two days after the fire for the funerals, which brought out thousands of mourners." In the photo section there is a photo of a fire engine and the date inscribed or painted on the fire engine is 1843. This may have been the fire engine that Fisher developed or invented and which he donated to the City of Hamilton. This engine was on display at Dundurn Castle for a time and then at a firefighters museum. It is not known if it was preserved or where it is today.